The case of the finest Muslim youth from the communities of expatriate subcontinent Muslims is quite unique. It is quite unique because the Indian being has a deeply rooted component which is inherited from Hinduism: The caste, and the delusion of superior purity. We are pak; the rest is na-pak; pure-impure. Contrary to the ruminations on the theme by the genial madman Nietzsche, and while agreeing with him that the Aristotelian concept of “equality among equals” is much closer to the Islamic ‘adl or “even counterpoise” than democratic blurring of hierarchical ranks, Nietzsche’s Indo-European apology of the caste system ought to be dismissed as sheer anti-Christian dialectics. It is a dialectical arena which solely concerns the settling of accounts between fading Christendom and post-Christianity (which Nietzsche obviously belonged to). We, as people of īmān, are detached from it: We transcend it without being the synthesis between the two opposite poles. The Homo Islamicus from the Subcontinent never exported the Dīn by jihād to novel lands, unlike his Arab or Turkish counterpart (and by and large, exceptions like the majestic Aurangzeb apart, he never had an inborn taste and inclination for law, its theory and practice, and the passionate search for justice. He is quite different from his brethren in faith who descended from either Ismā`īl or Ishāq). That was his essential being while Islam, with Moghul rule, was at the height of its power in his subcontinent. When he migrated to the land of the Rūm in search of material comfort and aggrandizement, he migrated along with his caste-shaped psyche. He would simply benefit from the material prowess (technical, commercial, infrastructural) of the Rūm (who were impure disbelievers) while internally guarding his purity: monotheistic belief, Islam’s higher moral ground, food hallowed by the strictest interpretation of dietary laws, and the sanctity of their womenfolk who were untouchable to other than their fellow “caste members”. You might ask: ‘How can you possibly achieve that while settled in the land of theimpure?’. Of course you would be right in your critical observation, but there was nothing rational or carefully thought out in pursuing the said delusion: it was driven by guts, by the unconscious, as if in a trance-like state most of them have yet to wake up from. The underlying schizoid attitude has ravaged their children and grandchildren, who have fully grown up among the impure, sharing most of their lives with them from nursery school onwards. Many of their finest products, those with ardent commitment to Islam, have developed deep-seated resentment and detestation vis-à-vis their fathers. We of course understand the cosmological reason and empathize with them. It is however perilous to adopt that course. • Affiliation to crudely violent militants, as if by bombing or hacking to death some randomly selected unbelievers they might succeed in wiping out the whole impure people their forefathers migrated to and under whose secular jurisdiction they accepted to amass some chattels of the dunyā. In reality, it is not even the na-pak people they would love to uproot from the world. They would love to bomb their own fathers, grandfathers and agnates out of existence, but since they cannot do so they transfer their angst against the secular masters of their own households. • The visceral antipathy towards their own fathers (who have willed that hypocrisy and strenuously defended it) and the negation of anything related to their roots. They have to manly confront their societies, outwardly praising, certifying and implementing the noble aspects possessed by the genetic and anthropological patrimony Allah singled them out by, while openly underlining, criticizing, denouncing, rectifying and eradicating the sprawling weed of that conceited hypocrisy. Consciously change things from within your national communities, and draw help in that respect from the new Muslims as your declared allies; which they cannot be unless they, too, have their own discernible identities. The Muslim does not flee from the battlefield. He remains steadfast and fights on. this article is utter racist drivel. the author, so-called “shaykh” Ahmad Ali Adani clearly has on idea what he is writing about and is pandering to some rightwing racist agenda. the British Indo-Pak sub-continent communites are arguabley the most dynamic and integrated of all Western European Muslim ethnic groups. they are represented everywhere from industry, academia, sports, politics the arts and entertainament, and, most crucially, the dawa/invitiation to islam. most of the postisve outreach literature found in western europe is based on local translation of content first authored and published in English by British Muslims – a mojarity of whom are still from the sub-continent. an overwhelming majority of the thousands of conversions in the UK to Islam from the wider “white” communuty are at the hands and efforts fo the 2nd and 3rd generation sub-continent diaspora. finally, the photo atop this article is that of Anjum Choudary. he is/was the reviled by “Muslim” all of the UK and was regarded by many as a patsy. his arrest was welcomed by the mainstream British Muslim population (most of whom, again, are of Indo-Pak heritiage). 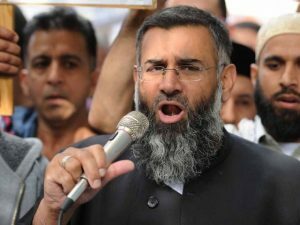 Choudary’s mentor was the former UK Hizb-ut-Tahrir leader Omar Bakri Muhammad, a Lebanese national who is now banned from re-entering the UK. none of these extremists are celebrated by the wider British Muslim society. these clips below very well illustrate how sub-continent Muslim culture is very much a part of British culture… again, to say nothing of actual traditional Islamic dawa activities. For sure, shaykh (and not so called shaykh) Adani has no racist attitude to people of Subcontinent. Just because his beloved wife is Pakistani and his son from her feels himself more related to Pakistanis, than to Europeans. Shaykh Adani himself had been raised Islamicaly in the environment of South-African Deoband. So, he knows very good, what he is speaking about. yes, classic Deobandism is partcularly backward and insular. if all their Dar ul Uloom’s were to be relocated from the UK and South Africa to India, the students would hardly notice a difference. they teach islam in the west only through the prism of Urdu and strict Hanafism, and with a sense of exclusion and seclusion from the wider “unclean” society. but these people are not refelctive of the British Indo-Pak experience as a whole. Adnani is projecting his own experiences, and how Deobandis have this concept of pollution (and not only deobandis, barelwis also) from engaging with the wider society. but again, this is all old news. increasing numbers of Deobandis and similarly village madrassa mentality Indo-Paks are no longer on this trip and understand the obligation of mixing with non-Muslims in order to present Islam to them. the overwhelming majority of British Asian Muslims would find these attitudes Adnani is spekaing of alien and abhorrant and not understand why he is tarring them wtih the brush of his own bigotted upbringing. Good. But Adani (not Adnani, who was a speaker of IS), wrote it while living in SA, not in the UK. So, if it is not actual in the UK, we are happy to know about it.